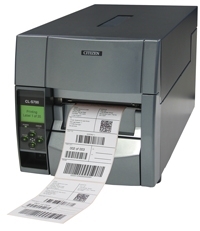 The CLP521 label printer from Citizen gets a good return on investment with an aggressive price-performance ratio and sophisticated features. High reliability, a durable and sturdy design as well as exceptional user-friendliness are the main characteristics of this thermal printer. Use this compact label printer for a large number of applications - even for especially price-critical projects. Maximum printing speed 100 mm/sec. Like with all Citizen printers, its design guarantees high user-friendliness. The menus and colour-coded buttons allow even inexperienced users to accomplish tasks easily and effectively. Changing consumables is particularly easy with the market-leading Hi Lift mechanism insert paper, close print head, ready to go. Users gain complete access to the device with the patented Hi Open solution. You can create up to 118 mm wide labels on the CLP521 without troublesome delays or roll changes. A printing speed of 100 mm per second and a resolution of 8 dots/mm 203 dpi guarantee efficient work at any time. The seamless adjustable sensor for inspection and reflection adjusts itself to different materials and widths. This function is particularly relevant for individual formats. For ergonomic printing of labels simply add on a dispenser yourself within seconds. An optional dispenser edge with integrated sensor detects if the label has been removed before the next one is printed. This is ideal for postal and shipping solutions, or even line applications that require simple label solutions. For ticket and other applications where continuous feed media are cut into predefined lengths, you simply retrofit the Citizen printers with the optional cutter. The CLP521 comes with three powerful integrated interfaces in all standard versions. That includes a high-speed parallel interface, a fast USB interface and a serial interface with a speed of up to 115,000 bits/s. Optional Ethernet and Wi-Fi interfaces can be installed for professional networking solutions. The printer is available in white or black, which integrates the label printer into any modern POS and production environment. The compact housing with integrated AC adaptor avoids messing with cables and additional external devices, while the printer displays professional performance.